— BugsInTheNews is a VIEWER-PARTICIPANT WEBSITE. This article by Jerry Cates, Stephanie Gaudin, Joseph and Elizabeth LeBlanc, Louise Giguere, and Andrea G., was first published on 6 May 2012, and was last revised on 1 December 2012. © Bugsinthenews Vol. 13:05(03). Stephanie’s photo was taken with a T-Mobile myTouch 4G smartphone camera, which provides 5 megapixel images and a LED flash. She kindly took a number of photos, but focusing was difficult and the posted image was the best of the lot. Still, it showed enough to make a good stab at an i.d. for her spider. That last part of my note to Stephanie was, though true, written mostly in jest. 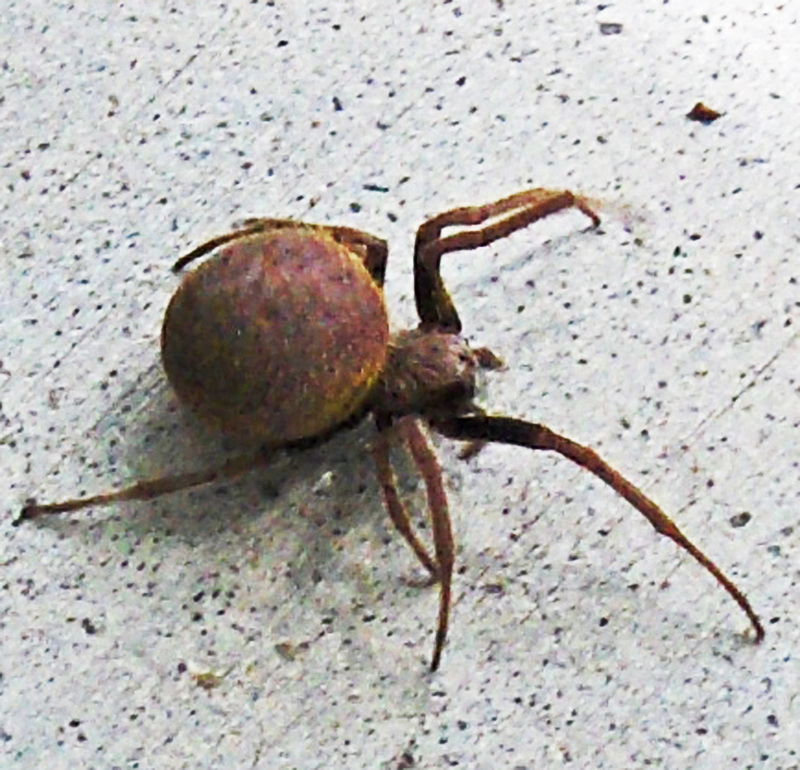 Not many people keep flying insects as pets, and of those that do, they’d probably keep them in enclosures safely out of the reach of this nocturnal orb weaving spider. The latter spends its day hidden well out of sight in the vegetation, and toils the night away spinning a fresh web, then waiting patiently for new flying insects to arrive with breakfast, lunch, and dinner on the wing. Which probably explains why I don’t receive a lot of photos of it. And why there is so little about this spider on the Internet or in the literature on arachnids, in general. For example, one authority (Gertsch, 1979) devotes only one sentence to it in his book on American spiders, another (Levi & Levi, 1990) omits mention, and two more recent books on spiders (Howell & Jenkins, 2004; Beccaloni, 2009) also omit mention of the genus altogether. We humans just don’t see these spiders very often, and since — in the case of E. ravilla — it plies its trade when we are asleep, it simply doesn’t garner much attention. 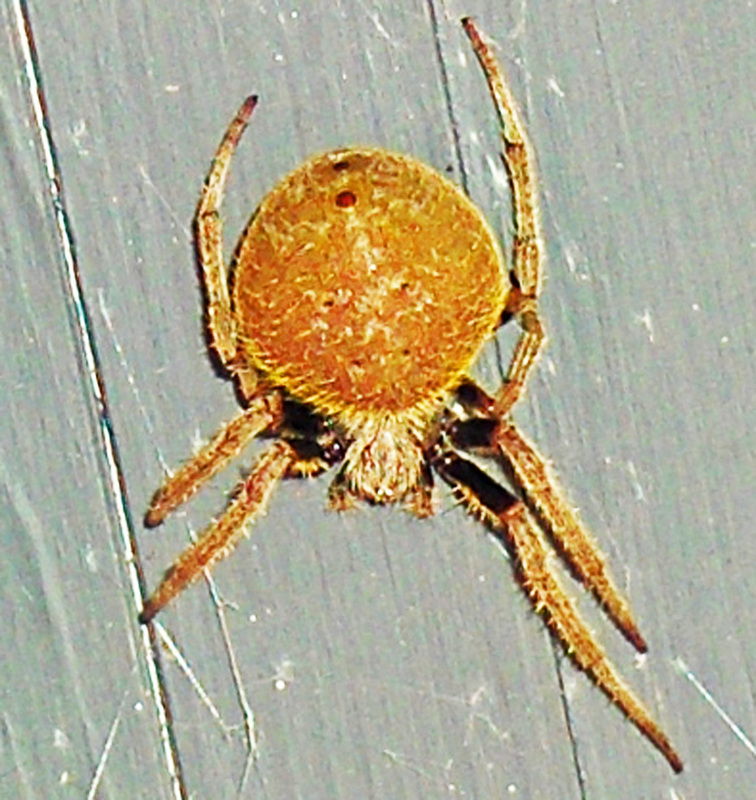 After all, it is one of our most beautiful spiders, particularly when adorned in its most attractive phase, with the brownish dorsal abdomen decorated in reddish fringes and a coalescence of white spots that form, at least to francophiles, a fleur de lis, to others a cross roughly similar to the markings of the diadem spider (Araneus diadematus Clerck). But, then, only a fraction of the females of this species are so adorned. Most apparently display an unmarked brownish dorsal abdomen. I have lost the reference for the moment, but one arachnologist was reported to claim that E. ravilla only displays these white spots as a juvenile, and loses them at adulthood. However, the evidence suggests that at least some mature females — including Stephanie’s specimen (our present focus) and a specimen photographed south of Houston by Joe and Elizabeth LeBlanc in 2009, posted below — continue to sport them into adulthood, and probably throughout their natural lives. The markings on a spider’s exterior apparently serve the spider in ways that transcend mere adornment. We humans tend to think their primary function is to help us distinguish one species from another, but — as might be expected — a certain physiological esoterica is also involved. Here I have to think of the facial markings on some of our venomous snakes; zoologists have discovered that those markings shield their venom reservoirs from ultraviolet light, and thus aid in preserving the venom’s toxicity. 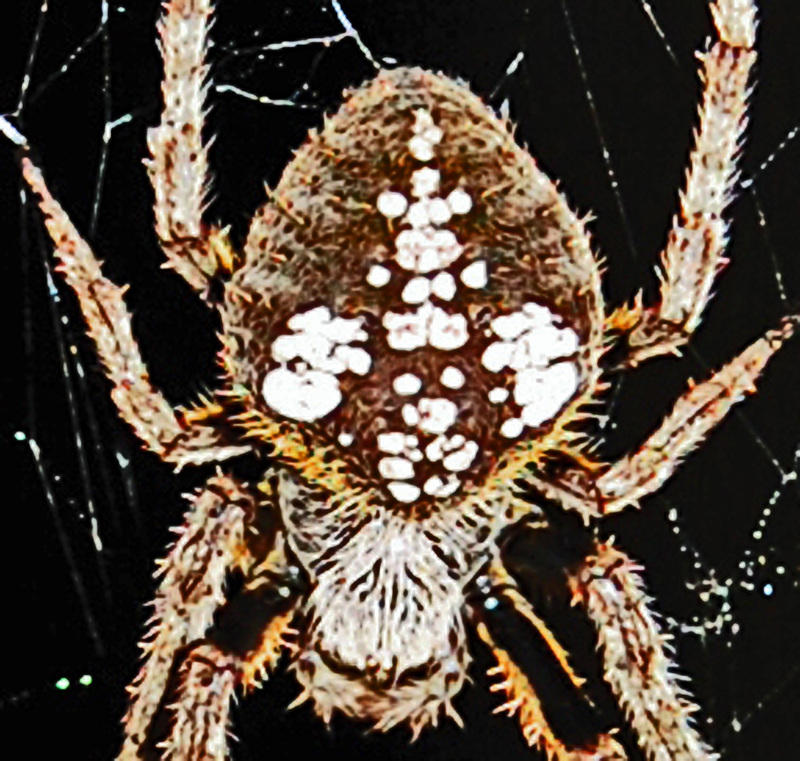 With regard to the markings on spider abdomens, one authority (Foelix, 2011, p. 62-64) points out that the white spots on the dorsal abdomen of the diadem spider (Araneus diadematus), among others, are produced by reflective subdermal guanocytes, which are specialized reabsorptive cells that take up metabolites like purines and store them as crystals. It is likely that the spots on E. ravilla serve a similar function, but one cannot help but wonder why some specimens of the same species have a multitude of such spots while others — indeed, from all indications, most others — have none. Ah, but life is replete with mysteries. Possibly, though, this is not a mystery at all, but one that has been asked and answered in some obscure laboratory of academia already. Or, if not, perhaps such an answer will soon be forthcoming. If either condition applies, and I become privy to it, I will be only too pleased to post it here. He didn’t mention the white spots in the form of a fleur de lis, but he did mention a mottling of light, which conceivably includes such an arrangement of white spots. I asked Stephanie if she might be able to photograph the spider’s ventral markings, as they provided the most definitive marks used for identification. She has promised to try, but noted that doing so will be difficult. As previously pointed out in several of my articles on other spiders, most cannot be identified to genus and species without examining the external genitalia. 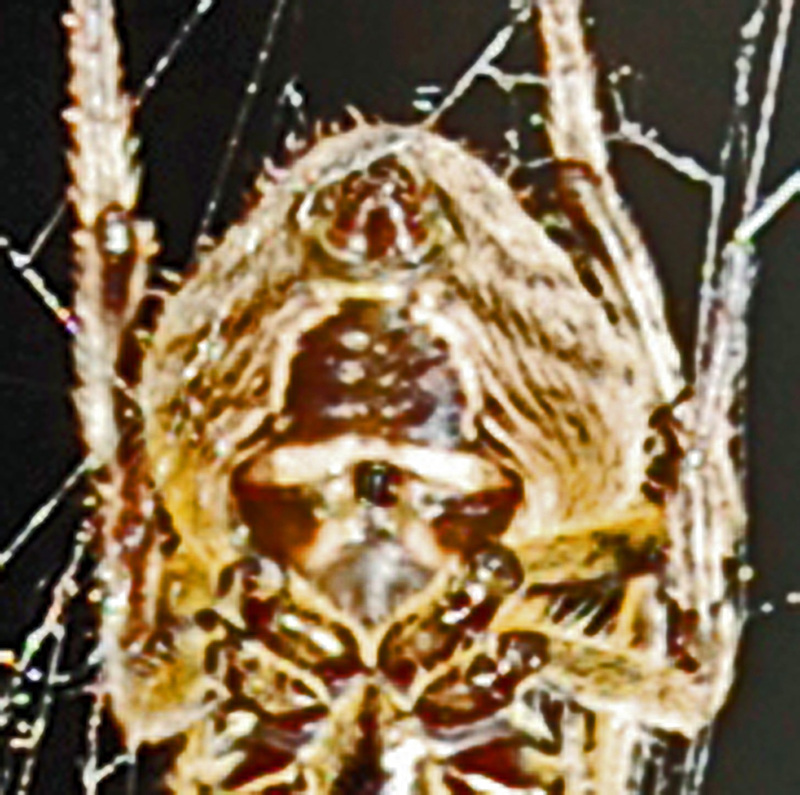 For females like Stephanie’s specimen, getting a look at the spider’s ventrum will easily dispel any doubts we may have concerning its taxonomical placement, at least to genus. In the two sets of photographs of other specimens of E. ravilla posted below, both received in 2009 from locations not far from where Stephanie’s photos were taken, the dorsal and ventral markings are quite visible for one, while only the ventral markings are visible for the other. “These are pictures of a spider in my back yard just south of Houston. It is rather large – several inches in size. I’d like to know what it is and if it is dangerous. We have dogs and the very large web spans a large portion of our porch. The photos sent in by Elizabeth and her husband Joe were taken using a Nikon D40 6.1megapixel digital SLR camera. My apologies for taking so long to reply. I’ve been updating my computer hardware and that put me behind. Your spider is a beautiful specimen of a Southern Orbweaver (Eriophora ravilla). 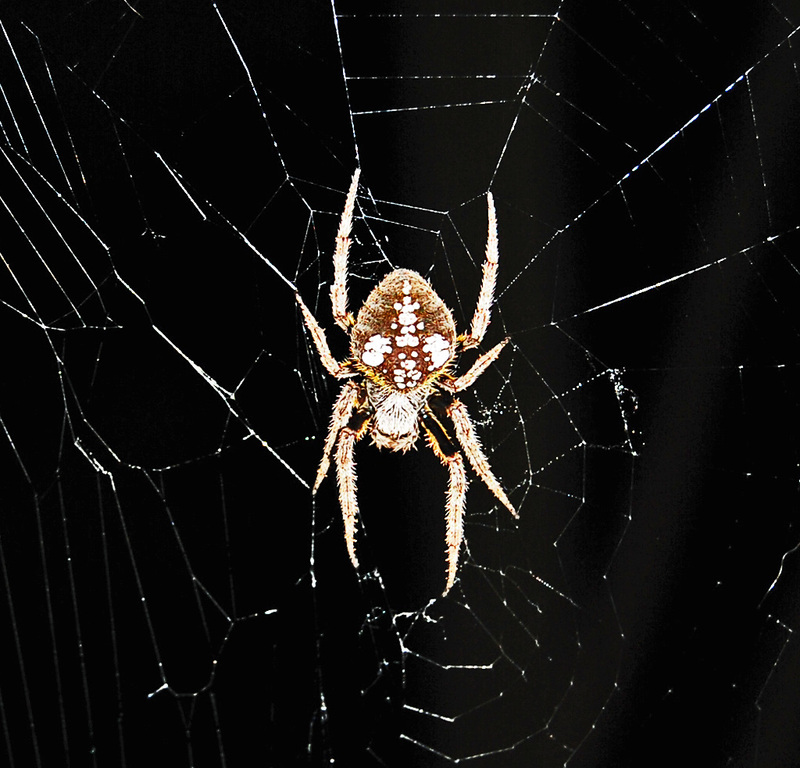 This, along with all our Texas orbweavers, is not considered dangerous. It will bite if handled roughly, but the bite is of no serious medical consequence most of the time (your mileage may vary, of course, so it is never a good idea to encourage such bites). Yours are the second set of photos I’ve received of this species this year, and I’ve not had any come in in previous years, so I am very pleased to receive them. Interestingly, your specimen sports markings on its dorsal abdomen (the white spots on its upper abdomen). You mention it is quite large, suggesting it is not a juvenile, yet this species loses those marks at adulthood. I would appreciate it if you could take additional photos in the next few days, to show these marks as the spider develops. “Yesterday, when the sun came up she abandoned the web. She was there when I went to work but by the time my wife woke up, sadly, she was gone. Thank you for you help. She was extremely beautiful and so large that it was hard to believe that she’s only a juvenile. If she shows up again, we’ll take more pics. The spiders of this species dismantle their webs as daylight approaches, then build a new web after nightfall. 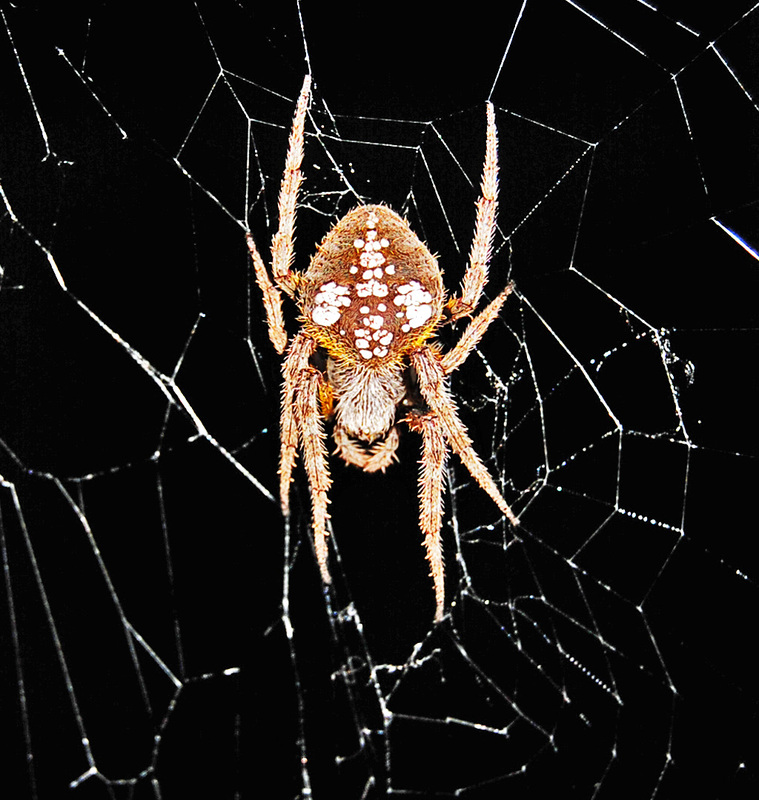 They remain on the web throughout the night, and chances are she is still around. I’ve been researching the species a bit more, in recognition of the obvious fact that yours is not a juvenile. This is a variation within the species that has the dorsal abdomen markings you see on her. The species is highly variable with regard to these dorsal abdomen marks. Some have a patch of green, others are entirely unmarked. Keep a sharp lookout, and if you are able to take additional photos, send them along. “You are absolutely correct! She’s back, and just as beautiful as ever. 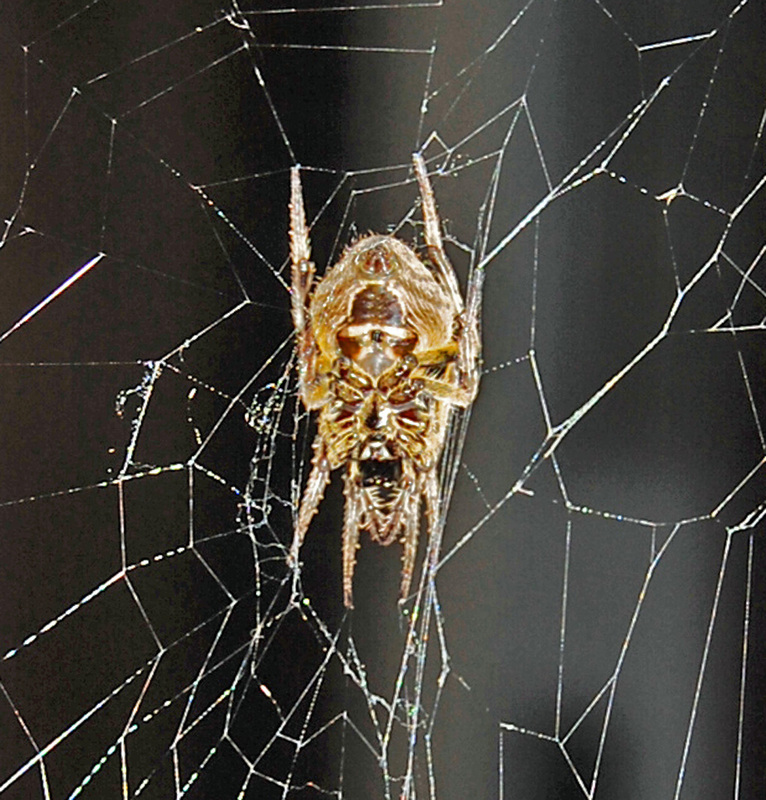 She’s built a new web in the same locale. Beth will send some new pics in the morning. COOL! Could you help me identify this spider? It seemed to be guarding my door! It has a very irregular and small web, as seen in the first pictures (white dots around it). It didn’t seem like it wanted to move much so I nudged it with the ruler. I live in Orange, on the south-east corner of Texas, not far from a bayou and a wooded lot. The pictures were taken around 03:30 PM (the hour on the picture is incorrect). The southern orbweaver (Eriophora ravilla) has all the features of your spider, but to make certain I’d need a photo of the underside of the abdomen. The markings around the epigynum are definitive for the species. 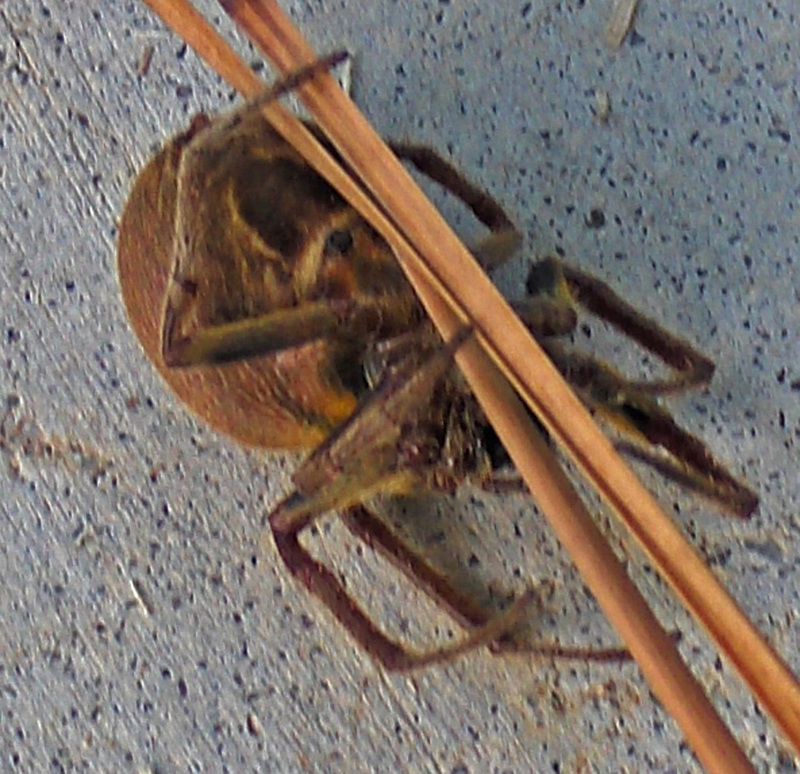 If, perchance, you are able to take a photo or two of that portion of this spider’s anatomy, I would be very grateful. For some reason I’ve received an abundance of photos of this spider this year. That would not be so remarkable, but for the fact that nobody has sent in photos of it in previous years. An interesting mystery, methinks. I just found another one that seemed very similar. This one was smaller and very sluggish – it looked half dead. I could easily turn it to take pictures of the abdomen. Sorry for the lack of quality of the pictures, I’m not equipped for macro. If many people have been sending photos this year, wouldn’t it be because there are nearer houses, because of an change in the population or in the population of their usual prey or their habitat? Louise’s photos were taken with a HP Photosmart R927 8megapixel digital camera with a 3x optical zoom. 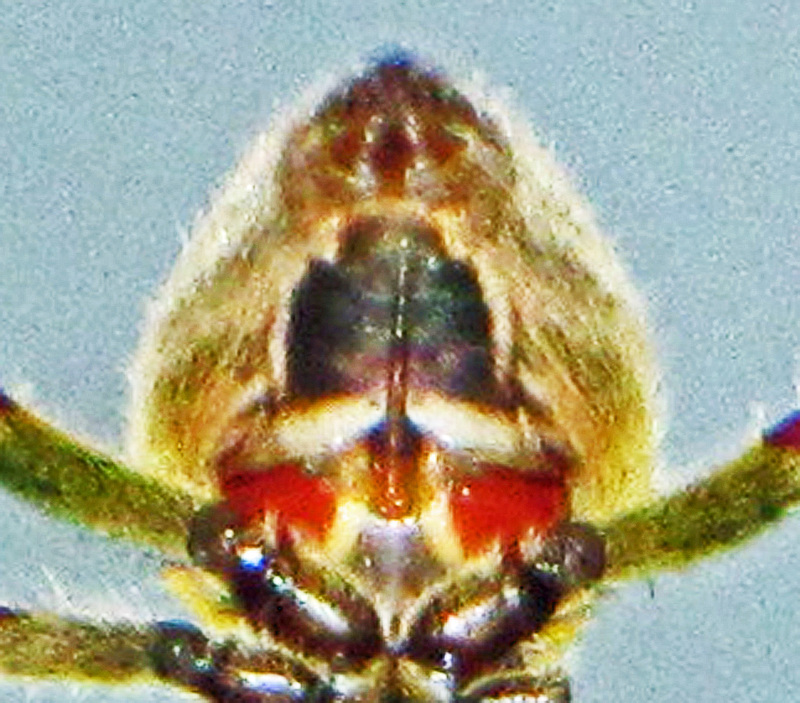 Your photos, as before, are outstanding, and the ventral markings shown in the last set are precisely those we’d expect of Eriophora ravilla, making this a relatively definite identification. It is a mystery why I’m getting so many photos of this species this year, when none have come in in previous years. The same thing happens, though, with other spider species, which makes me wonder if certain environmental conditions aren’t responsible. Now let’s discuss the photos Louise sent in. First, the dorsal abdomen is practically unmarked, except for two small, raised, circular reddish-colored tubercles on the posterior median. These are visible in figs 301 and 302, but are not shown in fig. 300, though possibly as a result of the photo being slightly out of focus. They are also not shown in figures 303-306, for what seems to be the obvious reason that those images are of the ventrum, whereas the markings are on the spider’s dorsum. However, it is possible that at least one of these markings would be visible in all of these figures as well, were they present with that specimen, because the images include significant portions of the spider’s dorsum. We must plead ignorance on this count, because the spider depicted in figs. 303-306 is not the same spider depicted in figs. 300-302. Louise stated it was “another one that seemed very similar,” but she could not be certain it was identical. That said, we note at least two important points about these two spiders that suggest strongly they both hail from the genus Eriophora, if not also from the same species, Eriophora ravilla. 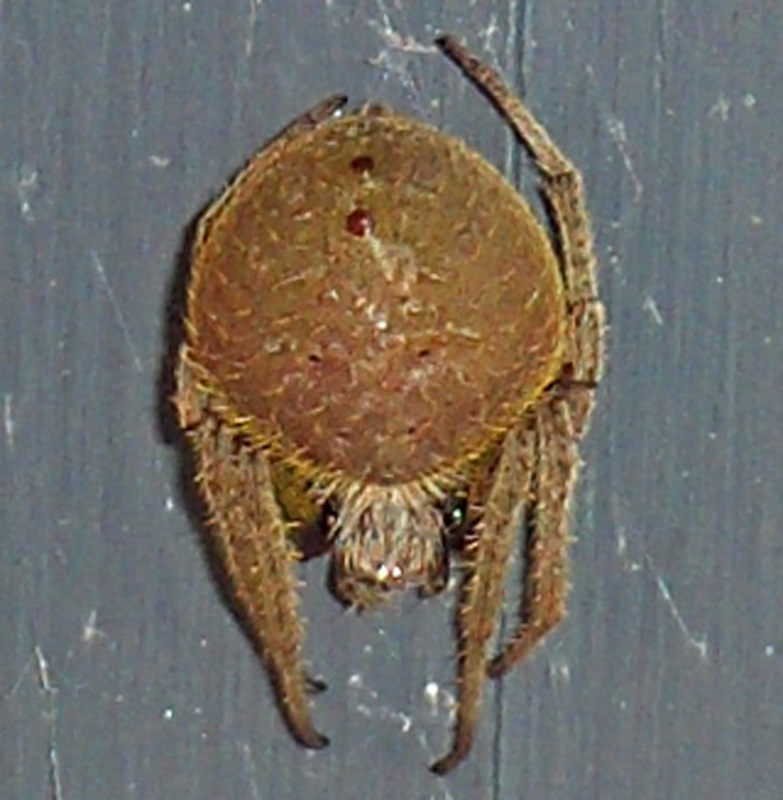 First, spider B is clearly a member of that genus, as its ventral markings are fully consistent in that regard. And second, spider A’s dorsal femurs (fig. 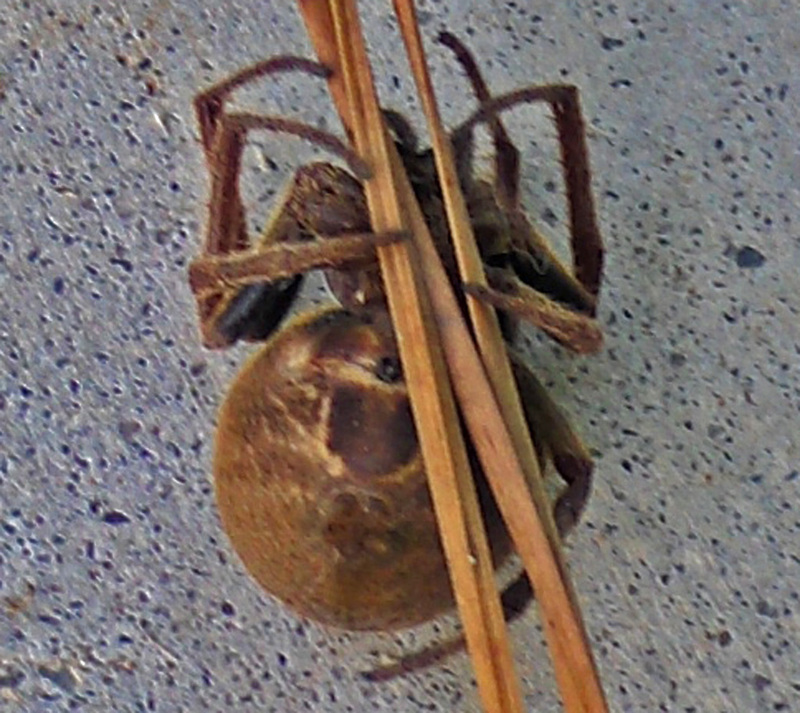 301, showing the femurs — i.e., the first long segments of each leg, near where the legs attach to the body) are unusually dark in comparison with the remaining leg segments. 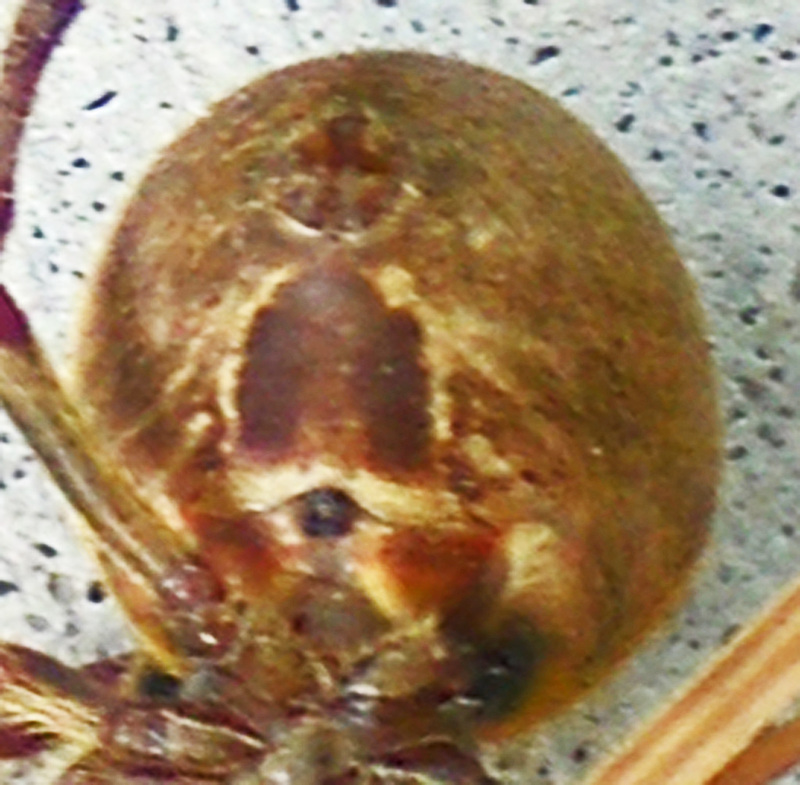 This character is not common among the orb weavers, but is found in each of our specimens depicted here, as both Stephanie’s specimen (fig. 100), and the LeBlanc specimen (fig. 202) testify. And based on these observations I feel relatively comfortable assigning both spiders (A & B) to the species which is the subject of this article. It is interesting that, for each of the two specimens on which it would be visible, the epigynal scape is missing. That character is diagnostic of the species, perhaps even moreso than the markings of the ventrum. However, the scape of this species is extremely long, and one presumes it is easily broken off during mating. In another specimen, reported to me by Andrea G., also from Houston but in March of 2010, the scape is entire, as shown in fig. 400, at right. Andrea’s specimen appears to be relatively young, though it is clearly sexually mature, as the epigynum would otherwise not be fully expressed. 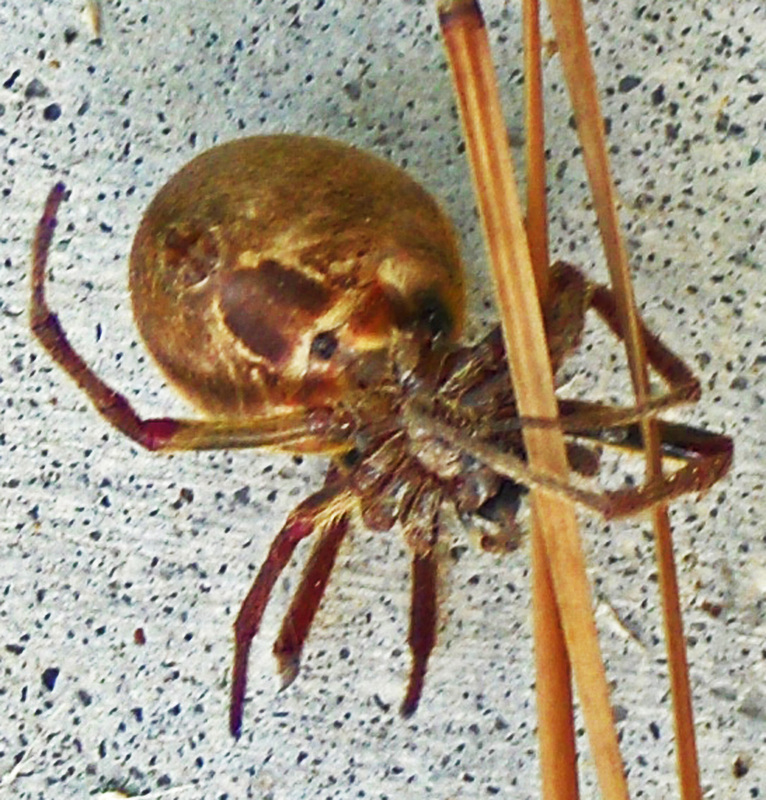 The likelihood that this spider has not yet mated is rather good, while the other specimens shown here, being observed later in the year, may have mated at least once, and possibly several times. Species Eriophora ravilla (C. L. Koch 1844) — first described in 1844 by the German entomologist Carl Ludwig Koch (21 September 1778 – 23 August 1857) using the Latin word ravus = grayish yellow + the Latin diminutive suffix illa to refer to a small grayish yellow orb weaving spider. I have one of these on my porch. We are in Jackson County. Edna, TX. I am so glad she is not dangerous. 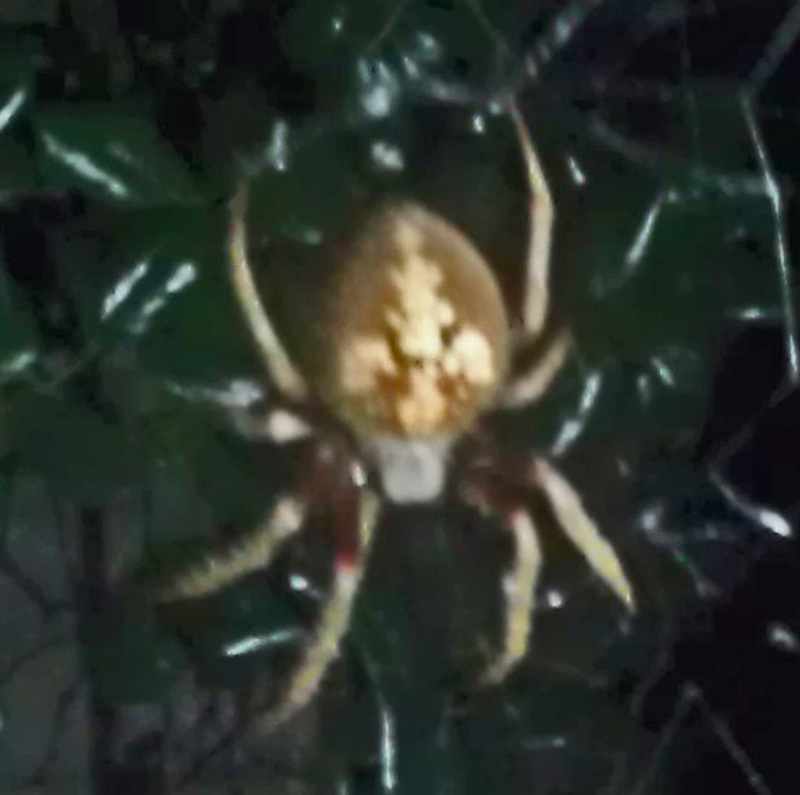 I just emailed you a photo of (what I think is) a Southern Orb Weaver. Looks exactly like Louise’s photo above. A june bug was caught in its web and we watched her wrapping it up. Pretty cool. Thanks for all the info. Hope that you receive this as it’s been awhile since this was written… but I just came across one of these spiders yesterday evening and had taken some pictures of it building it’s web. It was quite a site to watch the spider build it’s web. With that said though, I am glad that it isn’t dangerous to me. I live in baytown, texas east of houston. This is the first time I ahve seen this type with the markings that she had. The spider had the same style of markings as the first person’s pictures. I have found a specimen that seems to answer to your examples of a Southern Orb Weaver. This one is quite large, with a pattern similar to an ornate cross on its dorsal. Sorry, no photos of the ventral, as it was spotted on our daughter’s driveway in Midlothian, Texas (south of Dallas.) After getting a photo, I herded it to a nearby flower bed and a pile of dead leaves. Not sure how to post a photo here but if you e-mail me, I will be glad to send one. Thanks and have a great week!